Some people choose to retreat into fantasy in order to find their heroes. Others choose to believe the inflated mythos of historical persons. Both may find admirable role models, but neither will come to grips with reality in the process. The reality is that all humans are flawed. Our capacity to even conceive of perfection is, in of itself, a marvelous thing, one of many which elevates man above the animals. But to assume that we are perfect at any point can only lead to disaster. Such is the case when people beatify ancestors who, in the end analysis, were just as flawed as the rest of us. Without learning from their mistakes, their triumphs only serve to delude and lead astray. The Great Captains are victims of such misunderstandings. These were men (and on rare occasions, women) who left so powerful a mark on human history that their names are understood long before any serious learning is done about them. Napoleon and Patton are virtually household names, but the stereotypes about them are manifold and, worse yet, those who claim true understanding often have a merely superficial one which either canonizes or demonizes without quarter. In the following article, the first of a series of many over the course of my studies, I will take one such famous person and do my best to critique them in the most concise way possible. I consider every single one of them my heroes. But my heroes are humans, not characters. Shining light on their failures is just as important to me as adopting their noblest virtues. That Frederick fancied the arts and admired French culture essentially tells you where this led. A Spartan and violent upbringing, an executed friend, and three decades later, Frederick William I died, leaving the Kingdom of Prussia to an heir he “never saw without threatening with his stick.” Embittered, and in many ways disillusioned, Frederick II at first raised the hopes of great minds such as Voltaire who believed Frederick to be the upcoming model of enlightened despotism. In short order, he crushed those hopes underfoot. Frederick had inherited the most finely drilled and best led soldiers in Europe; his father had died without ever having sent his creation to war. The “effeminate heir” sought to rectify that. What followed was a series of wars (all of which he started), many of them reeking of Realpolitik (Frederick taking advantage of surrounding chaos), paranoia (preemptive attacks against suspected enemies who were otherwise friendly), and in some ways vengeful (targeting Saxony, a culture he loathed with great passion). The Seven Years War, for which he is arguably most famous, almost saw Prussia beaten into irrelevance, if not partitioned and dispersed. Contemporaries thought him insane for engaging in a losing war one minute, and brilliant the next for succeeding even when circumstances entirely out of his control worked entirely in his favor. Through it all, Prussia won tremendous victories and expanded its domain, launching it squarely into the limelight of European geopolitics. By the end of his reign, citizens were in many ways happy to see him gone; his governance had been “stable” to a fault. In personal matters, he was either a jovial gentleman or an angry fiend. Those who agreed with him were treated decently. At times, the battlefield would strike him with romantic fancies, and he would grant kindnesses of all kinds to the lowliest soldiers. A man of sharp wit, he enjoyed tearing his enemies apart through humor. And yet, even trusted generals and bureaucrats who deviated from his dictates were met with the most scathing reprisals. The wounded soldier he would give a handkerchief to dress a wound, he would later brush off as coming from a dimwitted East Prussian population. Even his vaunted friend and confidant Voltaire, a man who was perhaps just as pugnacious and strong willed as Frederick, was ordered about as casually as a slave, and harshly reprimanded for falling out of line. Those who wrote of him personally after his death either loved him or hated him. A frail man, a hypochondriac to his core, Frederick died alone in his room at the age of 74. Although he left numerous testaments for Hohenzollern successors, the only image he wished history to record was that of the portrait above, where he is noticeably aged and infirm, wearing a characteristically simple uniform with a deficit of awards and gilding. Despite this seemingly bipolar behavior, Frederick was actually remarkably consistent, and whenever he did good and great things, that consistency carried him through. While he loathed German culture, finding it backwards and inferior to the prestigious French, this did not budge his sense of patriotism. Prussia was perhaps the sole love of his life. He considered failure in war to be equitable with death and the destruction of Prussia; however much he considered himself to be the embodiment of the state, it cannot be said that Frederick was not willing to take the last bayonet in defense of his country. Furthermore, this obstinacy shone through in everything he did. At the lowest points, even while seriously contemplating suicide, Frederick pushed aside the worst of his thoughts and attempted to “retrieve the situation from the jaws of disaster” numerous times, succeeding far more often than not. While it is true that twists of fate often delivered him from defeat, it was his tireless efforts before such events that let him live long enough for them to happen in the first place. Despite being a hypochondriac, he nevertheless kept up a brutally demanding regimen which hardly changed between peacetime and wartime; for Frederick, “action is the cure for all ailments.” The effeminate boy had developed into a proficient horseman and vigorous statesman and battlefield commander. His feats of physical bravery, such as carrying on casual conversation amid direct bombardments, would be legendary were they not also completely true. And even during the busiest and most nerve-wracking catastrophes, he found time to enjoy himself and console his courtiers, regularly composing and playing flute compositions with full ensemble, or taking prodigious amounts of Spanish snuff. What strikes the historian most is his combination of supreme humility and supreme confidence. He readily acknowledged mistakes, but only after the fact and with overriding proof. This was most evident when writing memoirs on his wars, and creating testaments for his successors. At the time, of course, his word was unchallenged, but he was a man of truth, and always bowed to it in hindsight. It was demonstrating the truth on the spot that was the trick. But every man has faults, and every great man’s faults are magnified by his actions. For Frederick, his worst vices were woven between these noble characteristics. To begin with, Frederick was a micromanager par excellence. Nothing escaped his intervention, so common and so thorough that it sometimes ruined the plans of others and ultimately damaged the process. His military commanders, although some exceedingly bright and incredibly talented, were often kept in the dark about his plans. At a time in history when command had to be decentralized due to communication difficulties, this sometimes resulted in inexcusable defeats on the battlefield. This control-freak behavior would have been the downfall of himself and his country had he become significantly incapacitated or killed. Luckily, neither occurred, and the rest is history. His taste for Realpolitik, the source of his apparent inconsistencies, was also a critical failing in some respects. It got him into trouble more often than it got him out of it, and tarnished his reputation among those who were stabbed in the back as a result. This was the direct cause of both the diplomatic coups and disasters which caused and ended his wars; to foreign governments he simply could not be trusted. It extended into his personal affairs as well, as he was not above scandalous deception in order to bend subjects to his will. His outwardly simple appearance was as much an attempt at manipulating the impression he left on others as it was his own disregard for the trappings of state and aristocracy. The underlying motive was always the expansion and practical betterment of his country, which results in a moral gray area I need not elaborate on. Finally, his view towards learning was a failure. His early ideas were fossilized and in places twisted due to his upbringing, resulting in a lack of evident intellectual curiosity. Where he acknowledged mistakes and held surprisingly enlightened ideas, there was little indication that he was actively seeking new ideas and learning from the mistakes of others before he himself committed them. All of his energy was applied to (supposedly) well-known practices in order to achieve extremely pragmatic ends, with a motto of working harder rather than smarter. The end result was a curious mix of Voltaire’s enlightened despotism and the stereotypical jackboot tyranny that he is often accused of instituting in Germany. When Adolf Hitler stared at Frederick’s picture in his bunker under Berlin, he was seeking the wisdom of a person he considered kindred, a kind of blueprint for himself, just as he wanted Prussia to be a blueprint for his Third Reich. Arguably he embodied the worst parts of Frederick while only attaining some of his virtues, and the Third Reich burned to the ground in response. The world, however, was very indiscriminate. Frederick the Great is often referred to as the origin of Germany’s aggressive and tyrannical actions in the modern era. Contemporaries may easily refer to literature of the Seven Years War and find harsh recriminations the likes of which were reserved for Napoleon and Hitler, only to ignore the great fame and admiration Frederick received immediately afterwards. Where our modern narrative claims Hitler led a gaggle of insane and immoral cronies on a rampage, Frederick’s era saw him as a noble underdog gallantly fending off insurmountable odds and elevating his country to new heights. The mythos of invincible Prussian soldiers lasted until the Battle of Jena, where the next modern “demagogue” grabbed the torch. Alternatively, there are those who completely overlook his faults and swallow the lines of Frederick’s “Anti-Machiavelli” whole. To them, Voltaire’s initial professions of divine bliss at the notion of an enlightened despot were the bread and butter of Frederick’s reign, and that the wars were merely diversions. Of course, those who idolize Hitler are also apt to idolize Frederick for patently obvious reasons. I doubt they appreciate the implications of Hitler’s committing the same mistakes. I could go on to cherry-pick those traits and actions of Frederick which I find most admirable and worth emulating, but that would be redundant. So too would be personal recriminations of his failings. Ultimately Frederick is an archetypal Great Captain, exhibiting stunning nobility in one hand and lamentable faults in the other. How much of either were the result of his upbringing is difficult to say. There is certainly an underlying value system at work here, one which he held to with great integrity. But, being inwardly focused, it often hurt his friends and his country, even as he was in the process of trying to help both parties. Perhaps it is his willingness to make amends after such blunders, in the face of an incredibly powerful ego, that makes Frederick so worthy of study and admiration. Say what you must of the precedents he set: Frederick the Great had character. 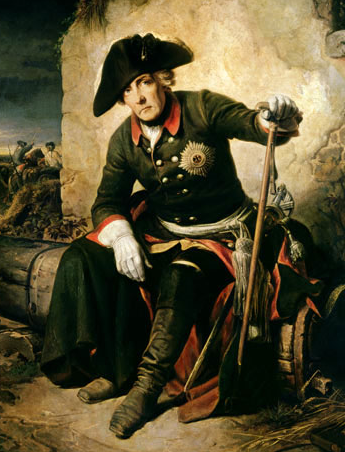 This entry was posted in Great Captains and tagged Frederick, Frederick II, Frederick the Great, Great Captains, History, Kingdom of Prussia, leadership, politics, Prussia.